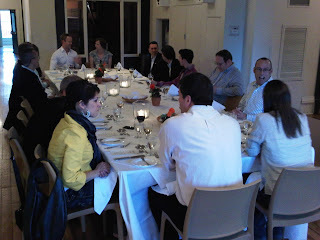 Tonight we had a dinner hosted by the absolutely amazing Gladstone Hotel. Located in the artistic West Queen West in Parkdale. We entered the hotel and were greeted by Hank - the hotel's legendary icon. We were privileged to see a few rooms - each one designed by a different artist and having a very unique feel to it. The walls in the hallways were littered with installations and the place just beamed art and expression. I personally love art and the way they mixed it into the hotel was seamless. They treated us to a wonderful dinner - the main course being a fabulous duck entre. Wine was poured, laughs were had, stories were shared and the evening was splendid. We also got the insider view into what everybody would be if they were a kitchen appliance...just don't ask Carlos what his was!